​Why settle for basic carpet cleaning when you can have deep DetoxClean carpet cleaning that removes the toughest soils and stains? 416-SO-CLEAN Toronto Carpet Cleaning uses an exclusive 10 Steps Deep DetoxClean process powered by self-contained truck mounted units. The use of these truck-mounted units provide thorough, deep Hot Water Extraction (steam) cleaning by using consistently high-temperature fresh water and powerful vacuum suction. This means that we can remove tough stains that other methods leave behind. And, because truck-mounted units provide a faster drying time (eight hours or less) and deeper carpet cleaning, our technicians can ensure that you come home to fluffy, clean carpets with no excess moisture or sticky residue. The Hot Water Extraction (steam cleaning) method is a restorative deep cleaning process that is favoured by the Environmental Protection Agency (EPA). This deep cleaning method is preferred by all of the major fiber producers and leading carpet manufacturers. ​416-SO-CLEAN is the smart choice to care for and clean your carpets because all of our technicians are specialists and are certified for carpet cleaning and repair. All services are covered by our 416-SO-CLEAN “LOVE IT or DON’T PAY” guarantee. ​If your carpet has stains or odours because of spills, pets, cigarette smoke, or more, 416-SO-CLEAN can remove these from your wool or synthetic carpets. 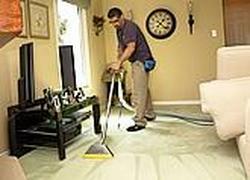 Our technicians can also make your carpets more soil and stain resistant by applying fabric protectors. It’s a wise investment, particularly for light coloured and natural fabrics and here is a Before-and-After 416-SO-CLEAN success story of Black dust stain removal from fabric protected white wool carpet. The application of the fabric protector is one of the treatment option available in our Platinum Package, one more reason to choose the 416-SO-CLEAN Carpet Cleaning Platinum Package. ​Not all stains can be removed completely, even with the use of professional spotting agents. Due to dye characteristics, PH effects, oxidation and other reactions, some stains may be improved but not completely removed. 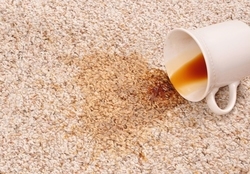 A spot is a foreign substance on fabric, such as a spill of coffee, wine, or even pet urine. 416-SO-CLEAN guarantees the removal of spots to make your rug spotless. However, depending on how long a spot remains on fabric, the type of fabric, and a number of other factors, the actual fabric dye or structure may have been damaged and this is called a stain (an example would be pet urine left untreated on wool rugs for days). 416-SO-CLEAN offers NO GUARANTEE ON THE REMOVAL OF STAINS. ​416-SO-CLEAN highly recommends applying our all-natural allergy relief treatment on your carpets if members of your household have asthma or allergies to pets or dust mites. This treatment creates a much healthier environment by reducing allergen levels by 90% or more. The 416-SO-CLEAN exclusive Detox Clean 10-step process has a wide range of benefits for you, your family, your home, and the environment. Read more..